I was watching the Olympics yesterday, like many here were doing on a hot Vegas late afternoon and I happened to see a teaser for what the local NBC affiliate deemed newsworthy. 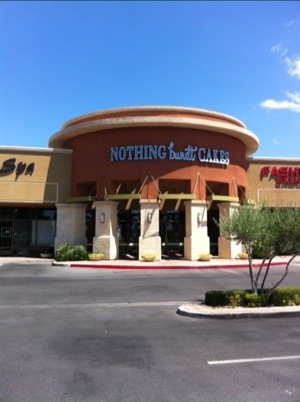 Featured was a picture of a cake from Nothing Bundt Cakes, a franchised store based out of Las Vegas and now to found in over thirteen states, California having over thirty. The card on the cake was a direct insult to President Obama’s out of context quote “you didn’t build that.” The Mormon-owned store, never open anywhere on Sunday (because no one eats cake on that day), proudly displayed a card saying “you didn’t bake this”, on the President’s birthday of all days! Obviously they support Willard Romney with this regurgitation of his campaign’s latest blatant LIE. I have written extensively how the Mormon community supports their own to a fault. This bakery is just another example. Let me guess, Nothing Bundt Cakes, you guys grew the sugar cane, the wheat flour and built all the roads to make and transport your products? I’m also wondering if you had much to do with laying down the phone lines your business uses quite frequently. Business in America is a collective effort. This is what President Obama meant and we are all socialist to a degree, like it or not. Myself and my family have patronized this store for years. Now you have definitely lost our business henceforth. Chick-Fil-A started a controversy when CEO Dan Cathy stated with his biblical references how we are far too audacious to challenge God’s laws on the definition of marriage. Actually, Dan, there is no place in the bible that favors one form of marriage over another . But this pronouncement brought out all the GOPs hate merchants whose love for Type 2 Diabetes is greater than their love for human rights. It seems I’m running out of businesses I can patronize. The moment I learn of a corporation’s unsavory political positions, I honestly can’t bring myself to spend a single dime in one of these establishments. 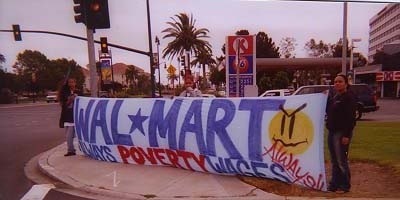 It’s been several years since I learned of Wal-mart’s practice of paying employees so little most are still on welfare to simply survive, and I’ve yet to step foot in one. Wal-Mart and Sam’s Club stores in the USA and Mexico have engaged in truly abhorrent treatment of all their lower echelon employees who do the majority of the grunt work. It’s pathetic how selfish the CEOs are to deny the workers healthcare and living wages while taking in record profits off virtual slave-labor. The great taste or convenience a business provides is far less important than their treatment of humanity. I will easily find other replacements for these stores who feel its important for the public to know who they support politically. Willard Romney’s Bain Capital has a vast history of destroying lives in exchange for obscene profits, just like the aforementioned corporations. I refuse to be a vehicle for hate to flourish and I hope more will join me in boycotting these right-wing businesses permanently. Great point. Remember after FLOTUS tried to teach healthy eating so Sarah Palin shows up at a school with cookies? My husband and i have been absolutely lucky that Jordan managed to finish off his investigation because of the suggestions he obtained using your internet pages. It’s not whatsoever simplistic just to continually be making a gift of methods which often most individuals could have been selling. We really see we now possess the writer to become grateful to for this. The whole illustrations you have made, the easy website navigation, the friendships your website assist promote it’s received everything powerful, and it’s leading our son and us consider that that concept is satisfying, and that’s fairly important. Thanks for all!